This mode employs a radar sensor to detect the presence of vehicles up to approximately 400 ft. (120 M) ahead, determines the current vehicle-to-vehicle following distance, and operates to maintain a suitable following distance from the vehicle ahead. Note that vehicle-to-vehicle distance will close in when traveling on long downhill slopes. The vehicle travels at the speed set by the driver. 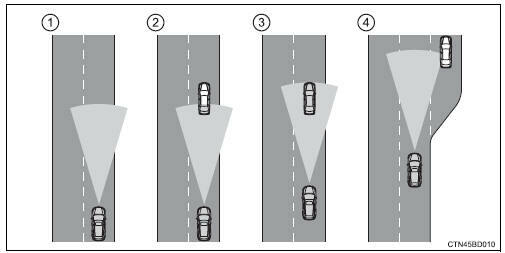 The desired vehicle-tovehicle distance can also be set by operating the vehicle-to-vehicle distance control. When a vehicle is detected running ahead of you, the system automatically decelerates your vehicle. When a greater reduction in vehicle speed is necessary, the system applies the brakes. A warning tone warns you when the system cannot decelerate sufficiently to prevent your vehicle from closing in on the vehicle ahead. The system continues follow-up cruising while adjusting for changes in the speed of the vehicle ahead in order to maintain the vehicle-to-vehicle distance set by the driver. The system accelerates until the set speed is reached. The system then returns to constant speed cruising.